This season has been a disappointment so far for Jeremy Lin. Not just his fluctuating ability, which is partially his fault as well, but once again falling into a situation with a coach that doesn’t believe in him and playing next to a shooting guard that isn’t as good as he thinks he is. Lin and Bryant don’t co-exist. Bryant wants the ball in his hand, and Lin needs it there too. This is the Los Angeles Lakers organization we’re talking about, so it’s not surprising to see the one getting the more touches and more credit. Byron Scott at some point decided on benching Jeremy Lin, and has no plan of promoting him unless Bryant is shut down or resting. 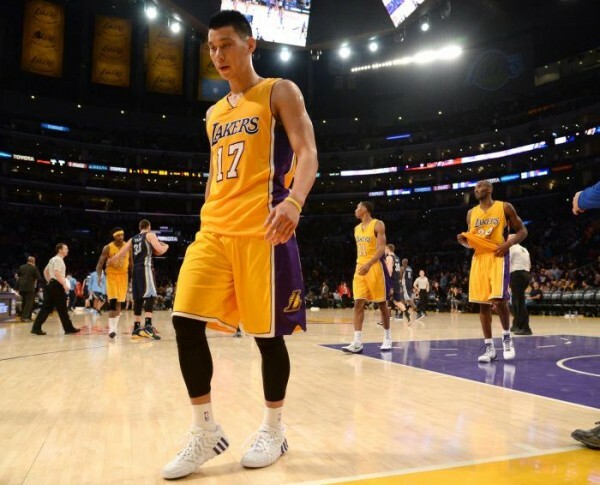 The start against the Utah Jazz showed Lin isn’t exactly benefiting from being ignored by the coach. How is he ignored? Because Lin is the only one losing minutes if he doesn’t play well in his backcourt. Ronnie Price gets minutes although he’s overall an awful player – or at least not on the NBA starting and significant backup caliber. Kobe Bryant? Untouchable. Lin? He can have good, excellent games in which he’s the main factor in a victory followed by getting only 16 minutes off the bench despite once again being the best player in those minutes. So is it surprising to see him lacking confidence and looking confused with what his role is even when he does get the start? I’m not sure Scott knows what he wants to do, let alone actually what to do, with this team. Are the Lakers tanking? Are they trying to get better? Are they looking for a trade to improve their cap situation even more heading into next season? Nothing is clear. There is just one constant: Kobe Bryant is here for one more season in which he’ll remain the highest paid player in the NBA. I despise tanking, and I hate the idea of a player fans pay tickets to see, regardless of how actually good he is, and that the franchise is paying $24 million a season for his services, gets shut down. It’ll be the second consecutive season it happens. Why not do it now if the Lakers are so worried about his health? They’re not going to make the playoffs, and Bryant’s basketball on most nights isn’t actually helping his team win games. Is it bad or good that Bryant doesn’t play? As long as Bryant refuses to change, it’s actually beneficial to have him off the court. Bryant has had games with the right balance of passing and shooting, but those are quite rare. The thing about Bryant is that he’s not getting better. Think he’s not giving the Lakers their money’s worth this season? Just wait until he tries to be the Bryant of 2000’s when he’s a year older. Maybe then he’ll change. Jeremy Lin will probably be long gone by then. In the meantime… It’s once again Lin in the hands of a coach who prefers giving others confidence, credit and minutes. We’ve said it at least a dozen times this season: Lin often needs to make more of the opportunities he gets. Be more confident and even selfish. But he’s made of substance. The team comes first, no matter how little part of this team regards him. He has half a season to do well enough to put himself in a good position heading into free agency. It might be out of character for him, but considering where the Lakers are right now, that should be his top priority.